Site members are individuals and families who enjoy the unique benefit of exchanging homes for holidays. It has a tremendous potential to generate goodwill among peoples of the world. We have set a very high standard in home exchange and site mebers are meticulously vetted and our reputation is second to none. The wide variety of choices and the high quality of service is why so many members return to HomeLink year after year. Our organizers throughout the world are experienced home exchangers and sources of much useful information. Your contact information is secured! With HomeLink contact information can not be accessed by non-members. Your security is guaranteed through our Messaging System & Password. With 28 offices around the world our database covers many desirable locations and you will have a helpful local organizer at your disposal. This HomeLink web site is represented by who is very experienced in home exchange. Modern 100m2 (1,076 sq foot) apartement in Northern Paris. 2 bedrooms, 2 bathrooms, separate toilets. 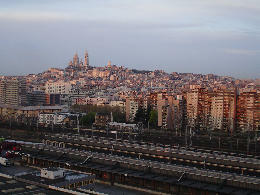 The appartment is on the 16th floor and enjoys a great view of Montmartre & the Sacre-Coeur. Metro is right outside the building and can take you to Montmartre in 10 minutes, to Notre-Dame in 20 minutes, and to the Eiffel Tower in 30 minutes. You can get easily from our home to Disneyland or to Versailles in a little bit more than 1 hour by metro and train. Small foodstore, pharmacy and post office next door. Bakery, all-day market and supermarket within a 10 minute walk distance. We have 2 small boys (3 and 6) so our appartment is fully equipped for kids: beds, crib, and lots of toys and kids’ DVDs! Our area is undergoing renovation works but as long as you don?t drive, the inconvenience is minor. Most people think they would love home exchange, but they can’t because they rent. In reality, you can do a home exchange even if you rent your home. It is a good idea to let your landlord know your plans. Often home exchangers will let their neighbors know about the exchange so they know to expect new visitors and the neighbors often stop by to make the home exchangers feel at home. When you calculate the expenses, it costs about half the cost when you do a home exchange. Home rentals and hotels can add up to hundreds of dollars, and when you have completely free accommodations it allows you to splurge in other ways. Many people take a much longer vacation such as a month instead of 2 weeks because they are saving on hotel fees. Many people will home exchange for a business trip. It is common to be relocated for short to long term business trips, so many people home exchange for their accommodations while working away from home. Not only does it save the cost of paying for your place back home and away, but it gives you the comforts of home instead of living out of a mini fridge in a cramped hotel. The top reason people do not home exchange who are interested, is that they think no one would be interested in staying in their home. In reality, every home has something unique to offer and there are likely interesting things to do in your area. So start thinking like a tourist to find why someone would want to visit your city. You can highlight what makes your home unique and interesting activities in the area. People new to home exchange are most concerned about security. They are worried about having a stranger in their home and if they might steal something. In reality, it is extremely uncommon to have any problems during the exchange. Many home exchangers have done multiple home exchanges so you can chat with their references, and you get to know the other party before the exchange to see if you are a compatible match. For added security, www.chectravel.com offers the only insurance specifically for home exchangers. It covers lost baggage, damages, and cancelations. In addition, www.WorldHomeExchanges.com offers a unique exchange contract that both parties fill out with all the details, sign over the computer and receive a copy by email. Be sure to have clear confirmation about all the details like travel date, number of people in the party, and how you plan to exchange the keys. About 200,000 people will do a home exchange around the world this year. There are people interested in exchange in almost every country and many people get so hooked on doing a home exchange, it is their primary way to travel.